What Is the Best Walking Foot Industrial Sewing Machine? Walking foot industrial sewing machines are used for heavy-duty projects. The machine is ideal for projects that require managing multiple layers of large fabrics. This type of industrial machine has a special foot at the stitching area that grips the top of the fabric. 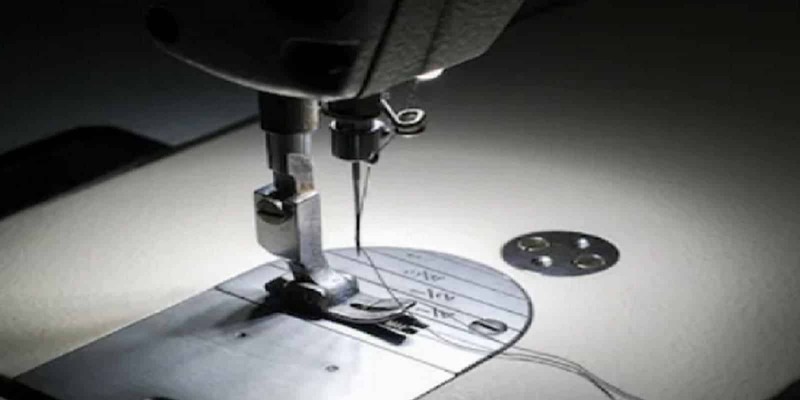 Using a walking foot industrial sewing machine ensures that the fabric moves smoothly when stitching. The fabric moves at the same rate as the feed dogs of the machine at the bottom layer. In this blog post, you will learn some tips on selecting the best walking foot sewing machine. Walking foot industrial machine is particularly suitable for quilting businesses. The machine prevents the puckering and shifting that happen with a normal sewing machine when quilting. A walking foot has a set of teeth that move in circular motion on the surface of the foot. The position of the side bar will determine whether the walking foot moves above or below the surface. The teeth move down when the bar is up and in the opposite direction when the bar moves down. A walking foot industrial machine is used for a variety of stitching purposes. Here is a look at some of the projects for which a walking foot industrial machine is used. A walking foot industrial machine is recommended for topstitching hems and button plackets. Using other types of sewing machines results in drag lines, and the problem even persists when using a blast steam to settle the cloth. Using steam pressing won’t solve the problem in case a fabric layer is topstitched after folding under. A non-walking sewing machine will scoot the top layer that may damage the fabric. The risk of damage is higher when stitching away from the folded edged. This is the case when stitching on a deep hem. Walking foot machine will even the layers, resulting in flat edges. You will notice the difference when topstitching necklines. The binding with a traditional sewing machine will create a noticeable drag line since the top layer is pushed on the bottom layer. On the other hand, the neckline sewed with a walking foot industrial machine stays flatter without any drag lines. Using walking foot industrial sewing machine is also recommended when sewing knit fabrics. These fabrics have the tendency to ‘grow’ when sewing with a traditional presser foot. This is particularly the case when sewing the cloth along the hem of t-shirts. In addition, the problem is present when sewing stretchy fabrics such as the rib knit. Using a walking foot machine will solve the problem due to which the knot fabrics won’t stretch out of shape. The fabric stitched using the walking foot machine will be less wavy and remain flat. A walking foot industrial sewing machine is also recommended when sewing a garment with a directional print. With this type of fabric, the pattern needs to align across the main seams. A walking stitch will ensure that the fabric is sewed with matching stripes, plaids, and seams. You should use a walking industrial sewing machine when stitching on heavy seams. Examples of bulky seams include areas where the fly opening meets the seams of the crotch or where the waistband meets the skirt’s seams of pants. A walking foot industrial machine won’t get stuck when sewing the garments. It won’t create a large nest of thread underneath when sewing such garments. It will effectively grip the fabric due to which it will move more uphill. This makes the machine great for stitching the tops of heavy fabrics like a home decor canvas. A walking foot sewing machine is also recommended when sewing a cloth item with separate cuffs or waist seam. The seam intersections need to be matched to create a continuous vertical or horizontal line that is pleasing to the eye. A traditional sewing machine will slightly scoot the top layer when sewing. This will happen even when you pin the garment properly. The result will be mismatched seam lines that don’t align properly. A walking stick will securely sew the layers without any misalignment. The layers will be sewed evenly resulting in a perfectly good stitching job. A lot of different factors determine the best walking foot industrial machine. You need to be mindful of the following factors when buying a walking foot industrial sewing machine. The speed of an industrial sewing machine ranges from 1200 to 5000 stitches per minute. You should select a model that meets your specific requirements. You may be tempted to splurge money on the fastest machine possible. But this won’t be a smart investment in some cases. To ensure that you buy the right industrial walking foot sewing machine, you should assess the amount of work done on a daily basis. If you tend to use the machine for a short period, you should consider opting one with a lower speed. Keep in mind that fast industrial machines have low needle force. As a result, thick fabrics can be difficult to stitch using a fast-industrial sewing machine. If you have never used a sewing machine, you should go for a slower speed sewing machine. You should opt for a model that has a clutch motor if you want to sew heavier fabrics like leather. A walking foot industrial machine with a clutch motor will effortlessly traverse through heavy fabrics. The robust machines are more reliable but use a lot of energy and also can be a bit noisy. If noise is a problem, you can opt for a slightly less powerful walking foot sewing machine that has a servo motor. These machines are less energy intensive and quieter. Some walking foot industrial machines have heavy metal frames. These machines are hard to move around. If portability is important for you, select models that have lighter frames made of plastic. Also, look for a walking foot industrial machine with a built-in handle and carry cases if portability is important. Industrial sewing machines with digital controls are more convenient. They are more convenient to operate as compared to sewing machines with manually operated switches and levers. 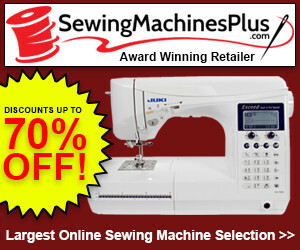 However, keep in mind that these sewing machines are more expensive. For heavy fabrics, you should select an industrial sewing machine with a walking foot feed device. The device supports the feed that results in even stitching. In case you will not be sewing thick materials, you should go for an industrial machine with puller feeds. Another important factor for selecting the right type of industrial sewing machine is the arm of the machine. You should select a sewing machine with an arm that will support the shape of the stitched clothing item. Cylinder Bed – The cylinder bed industrial sewing machine is used to reach small places. You should select this type of walking foot industrial sewing machine when you want to stitch car seat covers, sofa covers, harness, luggage, purses, footwear, and golf bags. Flat Bed – Walking foot industrial sewing machines with a flatbed are the most common. For general sewing projects involving heavy fabrics, you should use this type of machine. Post Bed – For sewing upholstery, shoe, and other similar projects, you should go with a machine with a small surface. This sewing machine will allow you to better handle the upper portion of the show. Also, the machine will conveniently handle the fitting lining without puckering. This type of machines is particularly suitable for sewing sofa covers, boot tops, cushions, and luggage. Long Arm Industrial Sewing Machine – The long arm walking foot industrial sewing machine is suitable for stitching large materials like tents, sails, boat covers, tarpaulin, and parachutes. They are also the right type for sewing marine upholstery and upholstered furniture. An important consideration when selecting a walking foot industrial sewing machine is the foot lifting height. You should select an industrial sewing machine with a suitable clearance under the presser foot. The height should be according to the thickness of the material. Consider selecting a presser foot with a height that is at least 3.5 mm more than the thickness of the material. This will allow you to move the walking foot without any problem. Industrial walking foot sewing machines have different needle penetration force. The machines with lower height of the presser foot lift have less needle penetration force. The penetration force is particularly small for machines with a foot lift height of less than 20mm. So, in case the stitching material is very hard, you should select an industrial walking foot sewing machine that has a lower foot lift height. This is true for materials like Kevlar, leather, plastic sheets, plywood, and sailcloth. Apart from the power foot lift height, the needle penetration force is also dependent on sizes of the flywheel, needle bar stroke, needle bar movement. You can also use a speed reducer to greatly increase the penetration power of needles. Apart from the clearance with the ground, the amount of lift of the walking foot is also an important factor when selecting an industrial walking foot sewing machine. The foot stroke determines the climbing capacity of a sewing machine. You should consider this factor when sewing cross or thick point seams such as when stitching overlapped corners of car seat covers or sofas. Industrial sewing machines use different feeding mechanism. Make sure that you select a sewing machine with a top and bottom feed. The drop feed, also known as feed dog, and the presser foot feed will keep the layers smooth and even during stitching. Drop feed is mainly used in stitching apparels. The machine is used mainly in the apparel industry. This alone, without the presser feed, won’t be enough for stitching heavy fabrics. The latest industrial machines have a triple feed. There are more expensive but produce the best results. These walking foot sewing machines have two alternative presser feet in addition to a drop feed. They move the material by synching the needle bar motion. As the material moves forward, the outside foot is lifted that allows the machine to move the layers together. Here is a review of the quality walking foot industrial sewing machines that are currently available in the market. 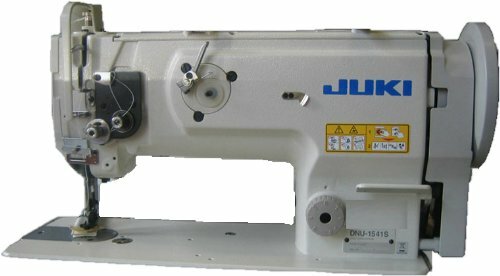 Juki DNU-1541 is a walking foot industrial machine that can make 2500 stitches per minute. The machine supports maximum stitch length of 9mm. The industrial sewing machine is ideal for sewing heavier materials like leather. This machine has a rectangular feed with a strong needle stroke. The industrial machine will walk through the material due to which it won’t stretch out. The sewing machine works as a servo motor, which results in smooth stitching. 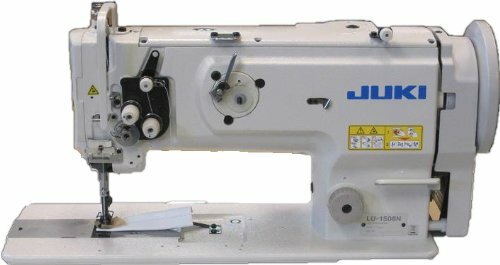 Juke LU-1508NS is another great sewing machine that is more expensive. This is because the machine can stitch at a faster rate of 2500 stitches per minute. The machine also has a servo motor that results in noiseless stitching. The vertical axis hook of the machine makes it great for sewing extra heavy fabrics. Juki LU-1560N is the priciest of the three since it comes with a more powerful motor. This allows stitching clothes smoothly. The sewing machine has a 2-needle walking foot that results in enhanced performance. The tips mentioned in this post will help you in selecting the best walking foot industrial sewing machine. 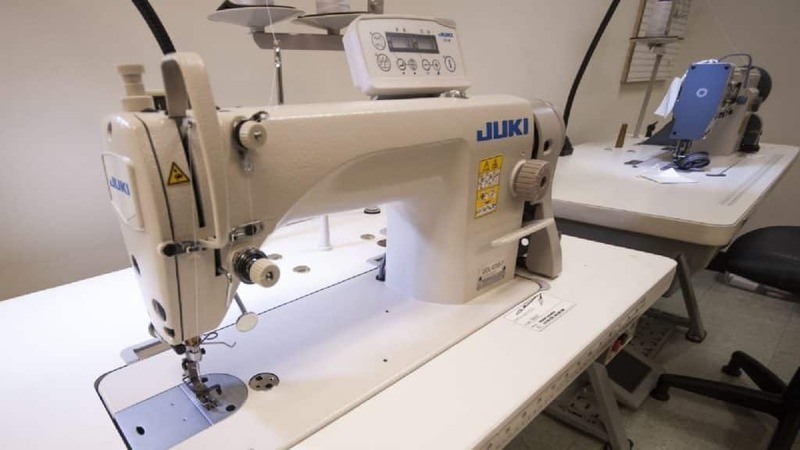 The last point to note is that these industrial machines can sew not just heavy fabrics like leather, but they can also do a good job in stitching lighter fabrics. If you tend to stitch both types of fabrics, you should consider buying a walking foot industrial sewing machine.